"Turkey is like a country condemned to be continually divided, a country that can never know the direction it should go"
The aftermath of recent independence referendums by the Kurds in Iraq and by the Catalans in Spain show that political problems arising from identity questions are beginning to preoccupy almost all nation states. Today’s nation states are either states which initially encompassed multi-identities but later adopted a single identity by force (e.g., Turkey) or have become multi-identity states through immigration (e.g., almost all Western nation states). Although I cannot discuss here all the whys and hows of the ever-growing identity problems in multi-identity nation states, it is clear that globalization plays a considerable role. Following Ulrich Beck, it seems that the processes of globalization create uncertainties and risks in the society and lead people to regard their identities as a safe haven. When considering the political implications of identities for nation states, a distinction has to be made between “identity politics”, which is the ability for each identity to express its own demands and engage in policy debates, and “identitarian politics”, which is one identity adopting a policy aimed at making all the other identities accept its identity. “Identity politics” may be considered legitimate up to the point where it aggravates other identities; however, “identitarian politics” accommodates a “totalitarian” and standardizing mentality. When people seek refuge in their own identities, this causes nation states to lose their cohesion. The Republic of Turkey—originally a multi-identity state—also has its identity problems. Among these, the most severe are those related to Kurdish identity, which have often led to terrible violence. Ethnic Kurds comprise nearly one quarter of Turkish society, and constitute much higher population densities in the so-called “Kurdish Provinces”. The ruling elite of the Turkish republic have been aware of the Kurdish identity problem from the beginning of the establishment of the state. Although spokesmen for the Kurdish political movement from time to time claim that their efforts are not “separatist”, these claims have never been found convincing by the elite. As the elite has failed to realize the necessary reforms, this problem has continued to this day, and in recent years has become a grave problem that demands an urgent solution. The steps taken by the ruling party towards a solution between 2013 and 2015 were met with widespread support, and several meetings and discussions had positive outcomes. At the most critical stage, however, the solution once again collapsed. Among the chief reasons for this failure is the suspicion of the ruling elite of the increase in the Kurds’ geostrategic importance, not only in Turkey but also in Syria. The environment of conflict that erupted after these developments has led to the formation of conditions of warfare, clashes between the state and the PKK,(The Kurdistan Workers' Party) and the loss of many lives. According to Turkey’s political elite, the Kurdish problem is one of “underdevelopment”. Many Kurds, and especially those living in economically “backward” regions, are poor. The elite claim that this leads some Kurds to be affected by Kurdish nationalist propaganda which holds Turks responsible for Kurds’ poverty and builds up hopes for some kind of Kurdish “independence”. Therefore, what has to be done, in this view, is to urgently provide economic support to regions where the density of the Kurdish population is higher to facilitate their assimilation into Turkey. Indeed, texts on the Kurdish problem in the party programs of the ruling AKP (Justice and Development Party) and CHP (Republican People’s Party) opposition are almost identical to each other. For example, the AKP programme states that “in eastern Anatolian and south-eastern Anatolian regions of our country, no significant steps have been taken in order to eliminate or at least minimize developmental differences. Our party will realize serious economic projects that will increase employment, will ensure necessary rehabilitation by putting relief programs in place that would relieve our citizens who have been affected by terror conditions.” The CHP’s party program likewise states that “in order to raise eastern, south-eastern regions of our country and other economically underdeveloped territories to the level of welfare in Western Anatolia, socially and economically necessary resources will be transferred to these regions under the guidance of the state”. In the second period of AKP rule from 2007-2011, concerns regarding the future of the nation state brought the necessity of solving the Kurdish problem onto the cabinet agenda. During this period, in order not to lose power against intensifying opposition from mostly the secular section of society, the AKP decided to court Kurdish support in the regions where the density of the Kurdish population is higher, and deployed a “pan-Islamist” discourse congruous with its own politics of Islamic identity. This approach, named the “Democratic Initiative” at first and later the “National Unity and Brotherhood Project” was in essence an integrationist-assimilative approach aiming to include Kurds as part of the Turkish nation state, while also reinforcing the AKP’s own political future. In fact, the traces of this approach can be seen in the curve of public investment expenditure realized during the AKP’s 15-year rule in provinces where density of Kurdish population is higher. Diagram 1 shows that, except for a brief reduction in 2012, public investments have consistently increased each year between years 2006-2014. Another finding is the sudden reduction after 2014 in public investments directed to these provinces. This decline in public investments after 2014 is more likely due to the deterioration in the economy than political reasons. Aggregated data on private sector investments in these Kurdish provinces is not publicly available. Assuming that the private sector behaves in line with the public sector, it can be deduced that investments realized in these provinces in the 2000s reached a considerable level. The data provided below by Türkiye Bankalar Birliği (the Banks Association of Turkey), using total values of “directed” loans and “non-directed” loans given by private and public banks. 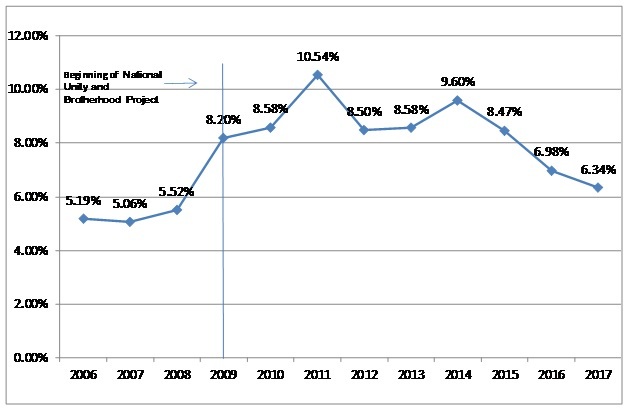 Diagram 2 shows that the ratio of bank loans increased more rapidly after the National Unity and Brotherhood program began in 2009, and, just as with public investments, this increase continued until 2014, when it began to decrease again. This decrease was due to both the general deterioration in the economy and the Turkish banking system, which operates at high costs and has generally avoided lending to SMEs and especially to those in agricultural regions with longstanding political problems. However, from 2009 to 2014 the government was able to increase the loans to the eastern regions by first appointing public banks and then encouraging private banks. It is clear that the combination of increased public investments and increased availability of loans realized in these provinces would increase residents’ incomes. Since increase in investments would increase use of several other inputs necessary for production, including labour, it is reasonable to expect increases in employment and thereby incomes. Indeed, Diagram 3 shows an increase in employment relative to 2004 levels in both “Kurdish” and “Turkish” provinces from 2009 onwards. The increase in employment in “Kurdish provinces” begins exactly during the period in which the AKP decided to transfer economic resources to the region in 2009, and employment figures continue to increase until 2016. It is obvious that in a region where investments and employment increase, incomes will increase too. Therefore, to show what has happened to the incomes of people living in “Kurdish provinces” during this period, per capita income (PCI) figures for both types of province are presented below. Diagram 4 shows that, from 2009 to 2014, per capita incomes of both types of province increased. Considering the decade from 2004 to 2014, it can be seen that national income has increased more than two-fold. By both increasing public investments and incentivising private sector investments through the banking sector, a significant improvement in the economic situation of the “Kurdish Provinces” was achieved beginning in 2009. In fact, as the graphs above imply, such economic support may also lead to improvements in overall national employment and income. With respect to Economic Income: The per capita national income series given above shows that there was an increase in per capita income in both “Kurdish” and “Turkish” provinces after 2009. 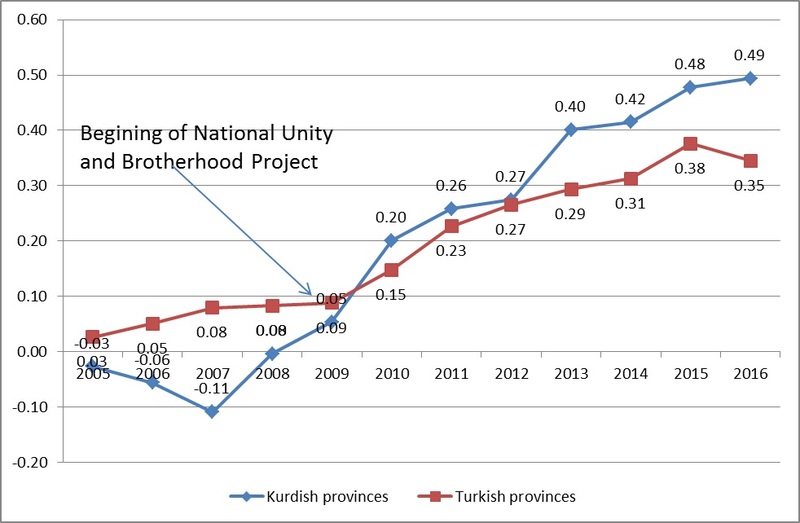 The graph below shows how PCI in the “Kurdish provinces” has changed over time relative to PCI in the “Turkish provinces”. This graph shows the same data as Diagram 4, but it also points to another fact: while the average PCI of people in “Kurdish provinces” is only around half (about 52-53%) of the average PCI of people in “Turkish provinces” from 2004 to 2008, from 2009 onwards, this ratio increased to almost three fifths (about 57%) by 2014. It is clear that the reason for this drift is that the government’s economic support policies functioned as a transfer of resources from Turkish provinces to Kurdish provinces. With respect to political inclination: Our second diagram summarizes political behavior by evaluating election results in “Kurdish provinces” during this period. 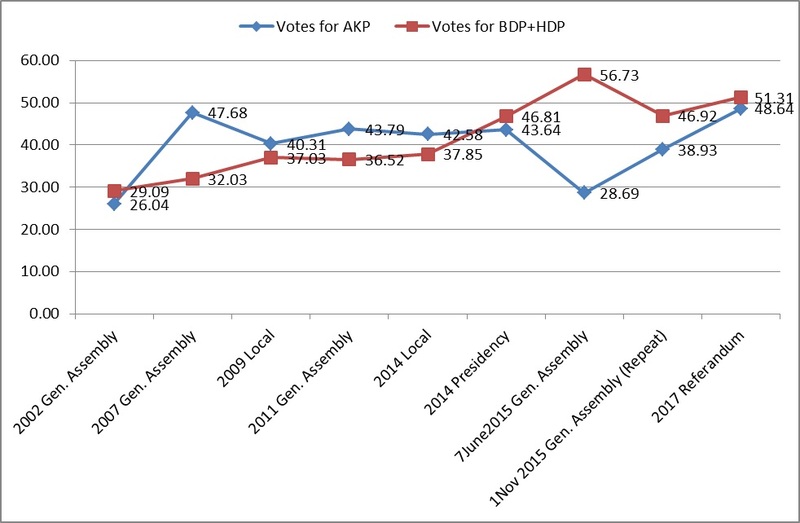 Diagram 6: Votes for AKP against votes for BDP/HDP in elections in Kurdish Provinces. In four elections held between 2007 and 2014, the AKP received more votes than the parties that give voice to Kurdish identity demands. Beginning with the 2014 Presidential elections, this trend suddenly reversed and Kurdish votes surpassed AKP votes in two elections and one referendum held after this date. The economic policies implemented by the AKP in the “Kurdish provinces” from 2009 onwards might have played a role in the increasing support given to the AKP by local communities in four local and parliamentary elections from 2007 to 2014. Nevertheless, this support decreased sharply after this date. During the entire period 2002-2017, there was a consistent increase in the votes of parties giving voice to Kurdish identity demands. These parties’ share of the vote, which was 29 per cent in the 2002 elections, rose to 57 per cent in the June 7 2015 elections, decreased to 47 in the 1 November 2015 elections with the return to war conditions, and then rose to 51 per cent for the constitutional referendum. This shows that the overall upward trend in Kurdish votes is continuing. From the data above, it can be understood that the Kurdish problem is not only “economic” and, therefore, that proposed solutions based only on economic considerations are unlikely to succeed. These conclusions suggest that the Kurdish problem, besides and beyond its economic components, is also related to questions of identity. Although the economic policies of the AKP may have made people in Kurdish provinces more prosperous, Kurdish people have not given up their identity claims, and, after the AKP’s failed attempt to solve the Kurdish question, they have continued to turn to pro-Kurdish parties. In this study, I have shown that the AKP’s development initiative, named the “National Unity and Brotherhood” project, whereby a significant amount of public investments and loan incentives were provided by the AKP government, could not by itself produce the results expected by the party. From our analyses carried out by using economic data, I have reached the conclusion that as a result of this policy, people living in “Turkish provinces” have ended up being the loser economically, and that AKP has ended up being the loser politically. People who live in “Kurdish provinces” have come out of this process better off both economically and politically, as it has led to the development of a "middle class" among the Kurds. On the other hand, becoming "middle class" can lead to a tendency to stay away from any "radicalism" because it means “having something to lose". This development must certainly be evaluated by the Kurdish political movement as it may eventually express itself as a demand for more civilian and democratic politics in the region. The most general conclusion that can be drawn from this study is that it is in the best interests of any national political elite to abandon identitarian politics which lead to repressive policies, and to implement a true politics of identity. Because repressive policies will ultimately lead to an economic and political loss. Ulrich Beck, Risk Toplumu (Risk Society) (2014). K. Özdoğan ve B. Doğan (trans.). İstanbul: İthaki Yayınları. See Gayatri Spivak, Outside in the Teaching Machine, Routledge, New York, 1993. Judith Butler, “Left Conservatism II”, Theory and Event, vol. 2, iss.2, 1998. Sinisa Malesevic, Identity and Ideology, Palgrave and Macmillan, New York 2006. The provinces of Adıyaman, Bingöl, Bitlis, Diyarbakır, Gaziantep, Hakkari, Mardin, Muş, Siirt, Tunceli, Şanlıurfa, Van, Batman, Şırnak, Kilis are provinces of Turkey where the density of Kurdish population is higher. In this study, I will use the term “Kurdish provinces” as an abbreviation for these provinces. Nevertheless, although the people living in these 15 provinces are mostly Kurds, people of other ethnic origins also live there. I refer to the remaining 66 provinces as provinces, where the density of the Turkish population is higher, and I will use “Turkish provinces” as an abbreviation although, again, many Kurds also live outside these 15 provinces, especially in metropoles such as Istanbul and Ankara. The AKP, which came to power again in 2007, advanced more political initiatives with the confidence gained from this success. This period is referred to as Recep Tayyip Erdoğan’s “journeyman” period. Erdoğan, in this period, at meetings held in town squares, used the phrase “I have trampled on all nationalisms”, showing that he was determined to find a peaceful solution; perhaps he was thinking that a solution based on “religious fellowship” could be possible. The economy grew by 8.9% in 2013, but could grow by only 5% in 2014. This deterioration in the economy continues until now. However, it is not clear whether there are other causes of increased employment and incomes. For example, economic solidarity behaviour within oppressed groups (the poor, women, indigenous peoples, people of color, gay, lesbian, bisexual and workers) resisting oppression may result in increases in employment and income among them. This must remain speculation due to lack of relevant data, however. Source: TUİK “Regional Statistics” database, http://www.tuik.gov.tr/PreTablo.do?alt_id=1075. Although this data does not accord with World Bank data completely, I chose to use TUİK’s data for the internal consistency of my study. The AKP is a party fed by the polarization of the society, and has not abandoned polarizing politics since it came to power. Even though it initiated the peace process, this feature continued. On the other hand, it is known that polarization leads to conflict and even civil war in societies with different identities. Indeed, in recent years, Turkey entered into a serious conflict if not a civil war. For these reasons, I think that the general characteristics of AKP governments’ policies are “identitarian” and "oppressive". The Barış ve Demokrasi Partisi (BDP, Peace and Democracy Party) and Halkların Demokratik Partisi (HDP, Democratic People’s Party) are two pro-Kurdish political parties. The BDP was founded in 2009 when Turkey’s Constitutional Court banned its predecessor, the DTP (Democratic Society Party). The HDP was founded in 2012 and, as part of a fusion of the two parties, twenty-seven BDP MPs joined the party in 2014. For a similar conclusion see Cuma Çicek & Vahap Coşkun “The Peace Process From Dolmabahçe to Present-Day: Understanding Failure and Finding New Paths” Peace Foundation, April 2016, Istanbul. p. 21. “The majority of the people didn’t support city clashes; the PKK didn’t find the answer it was looking for. The people didn’t stand behind the trenches and barricades and didn’t favour the armed autonomy complaisance. There are both economic (the middle class preventing radicalization) and legal ("the regime of punishment" after the internal security packages that made the street inactive) reasons for it”.